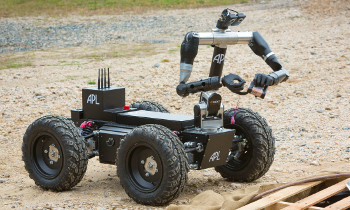 American Robot Company (AMBOT) deploys unmanned techonologies to support the next generation warfighter. AMBOT currently supplies Johns Hopkins University Applied Physics Laboratory with a GRP 4400 for the AEODRS Increment 2-3 risk mitigation prototype. 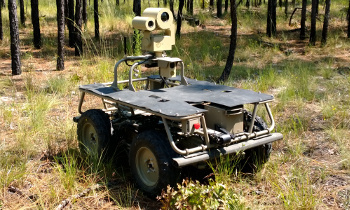 All AMBOT GRPs support the SAE AS-4 JAUS based AEODRS Mobility Capability Module (CM-MOB) logical interface, and the GRP TRAX is specifically designed to meet the requirements of the Increment 3 CM-MOB. The AMBOT MUTT system provides squad support to aid the warfighter. MUTT is capable of assisting in missions including: lighten the load, ISR, mobile power export and medical evacuation. 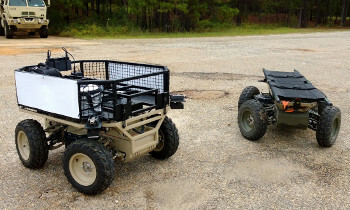 In 2013 the MUTT was invited to the MCoE Limited Robotics Demonstration to evaluate squad support concepts. Of the dozen systems presented, MUTT was the only one to finish the entire course. AMBOT's ISR solutions advance sensors into unknown environments while streaming critical data back to the operator. In 2014, this system was deployed to Afghanistan for in-theater testing and received praise for its silent operation and mobile agility. 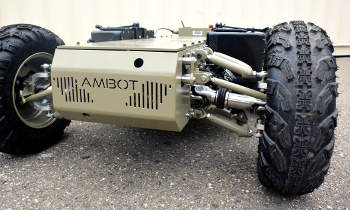 AMBOT's EOD solutions leverage the fast top speed of the GRP 4400 to get the robot to suspected IEDs quickly, while taking advantage of it's precise low speed control to inspect and dispose of threats.